I will be leaving the San Francisco Bay Area in one month and returning to Seattle. During the year I was here, I explored the hell out of the area. I saw more of San Francisco than many will see in years or decades. Two or three times a week I ventured into San Francisco early and then spend hours urban hiking. I estimate that I’ve urban hiked over 300 miles in the city. My hobby is espresso. I love visiting the best coffee shops a city has to offer. When I first got here, I made a cafe spreadsheet with all the places I wanted to visit. Each was a gateway into a new neighborhood. I’d find the coffee shop first, get a tasty beverage and then walk around the area. Many times I would find two or three coffee shops, sometimes miles apart and then build a hike around those stops. Here is a hike I did in February that ended up being 15.7 miles. Along the way, I visited four coffee shops and as you can from the map, several neighborhoods. If you are looking for my favorites, see My Guide to San Francisco Espresso (2015). After I completed my coffee shop list, I found a new hobby: Instagram. Years ago when I first moved to Seattle, I brought my camera with me on my hikes. It made the exploration more enjoyable. But over the years, I stopped bringing my camera and lost interest in taking pictures. With Instagram, I got the photo bug again. Now I can take a picture, add a location and share it immediately. Your hobby is likely something else. It doesn’t matter what it is, as long as you can apply it to the city as a way to explore. San Francisco is a hilly city. If you are not in shape, you will get winded quickly. Fortunately for me, I never get winded, because I understand that aerobic conditioning comes from strength and not from doing “cardio”. By making your leg muscles two, three or ten times stronger, you will find movement much easier. I can charge up an SF hill while holding a conversation without pause. I do ZERO cardio. I lift and I walk. I haven’t broke a sweat exercising in a decade. I was able to hack my leg strength by using the principles of HIT (High Intensity Training). This is not to be confused with the more popular HIIT (High Intensity Interval Training). HIT uses very slow controlled movements along with static holds to target fast twitch muscle fibers. And just takes minutes to do. If you are planning a visit to SF and want to get into shape, I highly recommend the workouts in the books Body By Science (machines) and Hillfit (bodyweight). You can also watch the 10 minute long Dr. Doug McGuff Workout video. Jump to 7:30 to see the slow leg press. Do that 1-2 times a week and you’ll never get winded hiking. I did a post a few months after I arrived titled The Temperature Wimps of San Francisco. 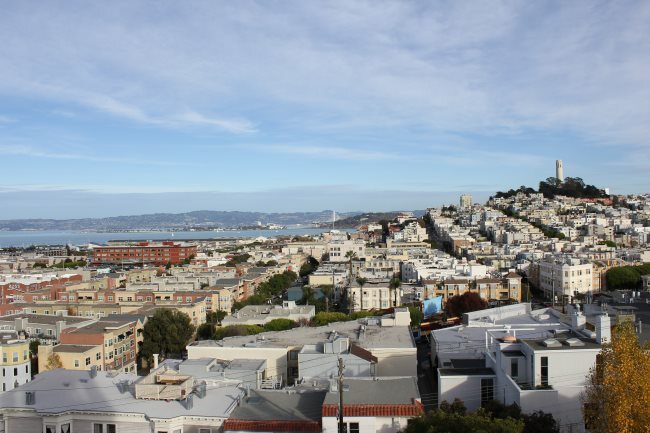 Hiking SF will be more pleasurable if you don’t have to carry around a coat or scarf. I have been here now for 11 months and I have not worn a jacket a single day. The coldest it has gotten has been 52 F (11 C). People here assume because I am from Seattle that I am better able to handle cold temperatures. Nope. People from Seattle are pretty soft too when it comes to temperature. Not as soft as SF, but still soft. I am resilient to colder temperatures by choice. I decided I was tired of being miserable when the temperature dropped, so I trained my body to throw off mounds of heat. I cover this topic in general on the post You Broke Your Own Metabolism and in detail on my Cold Weather Exposure page. The north part of SF and some streets in downtown can be windy, but most of the city is fine. Don’t believe that nonsense that SF is a cold city. The people in Minnesota are laughing at the ridiculousness of that statement. I know everyone has a smartphone with a GPS. I do as well. But I learned San Francisco with a laminated map. The map tells me the different neighborhoods and lets me gauge at a glance much more area than a phone screen. I also purchased a compass keychain on eBay for 50 cents. On a cloudy day, knowing which way is North is helpful. Explore the History of San Francisco…For Free! The San Francisco Library sponsors something called San Francisco Walking Tours. 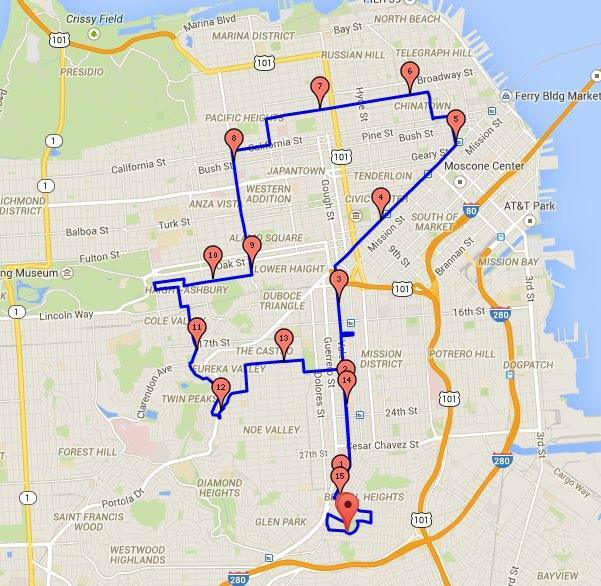 Every day there are multiple free tours (donations accepted) exploring different parts of San Francisco. I’ve been on about 25 of the tours and plan to do a few more this month. I’ve learned so much about SF on these tours that have taken me all over the city. I highly recommend doing these tours. Try and arrive ten minutes early. They do not wait for stragglers. If you get a chance to visit San Francisco, I hope this guide helps you. It is a wonderful city to explore. Great article! I totally agree about having a laminated map. I spent 10 days at the Fairmont. Took the drive to Carmel and San Simeon. Some say that ‘slow burn’ is tantamount to an isometric contraction. Michael Eades co-authored a book with Fred Hahn. Here are my notes. Hopefully you can access the Google Drive link. @Brian – I had one for Seattle and Kuala Lumpur too. Love the Streetwise series. @Gary – Reading your notes now. Thank you! @Nick – Which is why I stated that I do not get winded or break a sweat. Both of which I feel are conditions common to being in the aerobic zone. When I am am walking, my pace is relaxed and my heart rate lower than what is considered cardio work. I just realized you listed coffee shops in the south bay. I will have to go check those out with my parents! I’m always telling them how the coffee in San Francisco is better (and sometimes less expensive for better product). Awesome. Will definitely have to try Chromatic, since that’s practically from my hometown. Wish I had caught on earlier that you were in SF for a year. I’m sure my trainer (David DeSisto) would have loved to meet you and geek out on HIT. @Diana – I did get to met and him and visit his gym. Small world!